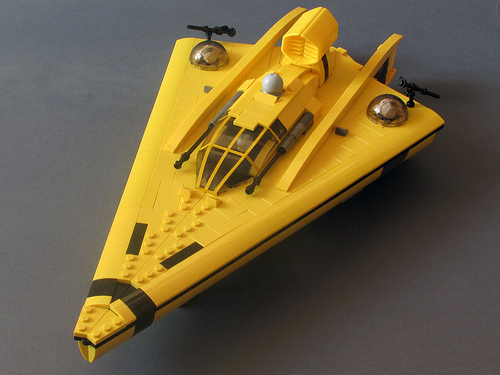 The wedge is a classic shape in LEGO starfighter designs, and that can mean a pointy model needs something eyecatching to stand out from the crowd. mrutek‘s Arrow does exactly that, through a combination of beautifully-shaped brickwork, and a retina-dazzling yellow color scheme. I’m a particular fan of the use of “bow” curves down the ship’s sides to create a lovely smooth section. Sometimes LEGO creations using one predominant colour can see the details get washed-out and lost, ending up a little bland. The builder escapes that trap here through some judicious striping, and depth of texture added through the use of smaller tiles. Personally, I might have gone with blue rather than black for the stripes to create a bit more visual jazz, but that’s nitpicking at an otherwise lovely little spaceship.